With Spaces, administrators can now create a dedicated space (or area), appoint people to be responsible for it, and assign content to a specific user group for that space. Space administrators autonomously manage all of the content in their space, while app administrators maintain sole access to user data and global settings. This allows for the efficient creation of news, menus, events, and forms—with an overview in the admin interface. For example, a baking company headquartered in New York with bakeries in cities across the US might have an employee app called CAKE where corporate communications are shared and where employees can access training tools, spotlight staff success, share CEO messages, host an organizational calendar, and more. 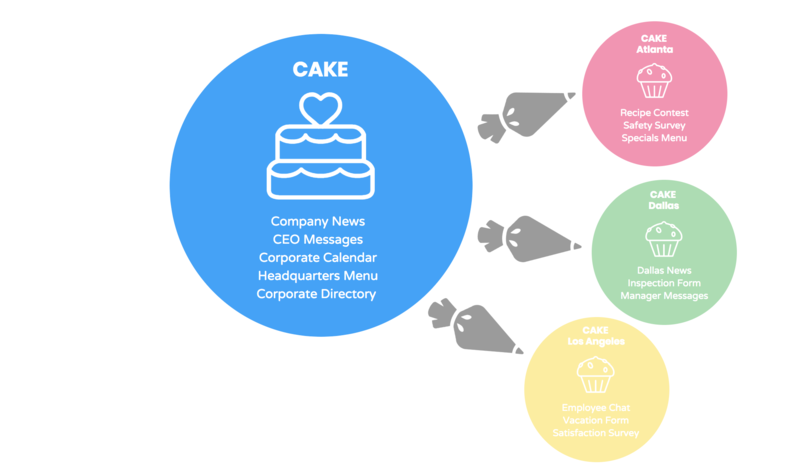 Within CAKE, the Spaces feature gives each bakery owner in each city the opportunity to administer and localize content to the employees in their specific locations. Within Spaces, bakery employees can learn about special events at their stores, hear from their managers, trade recipe ideas, message one another about schedule changes, etc. . . . all while continuing to see company-wide content shared to all spaces by founders and executives. And by virtue of being overall site administrators, company founders and executives can search Spaces locations to view content from all US bakeries in order to stay informed and connected with local employees and leaders. Why should a company use Spaces? Large companies with multiple locations often find it challenging to create and manage employee app content (news, calendars, menus, etc.) for various offices and target groups, such as employees, trainees, or alumni. But a company of any size can use Spaces to divide content management duties among separate sites or departments based on need. Spaces gives the option to create a distinct version of an employee app for different countries or sites while remaining within one administration system, therefore avoiding the chaos that often comes with building different solutions for different locations. Your IT team and content creators will thank you. How does Spaces work in an employee app? 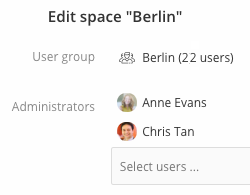 In Spaces, app administrators can now create a dedicated area and appoint other employees to be responsible for the management of its content for a specific user group. 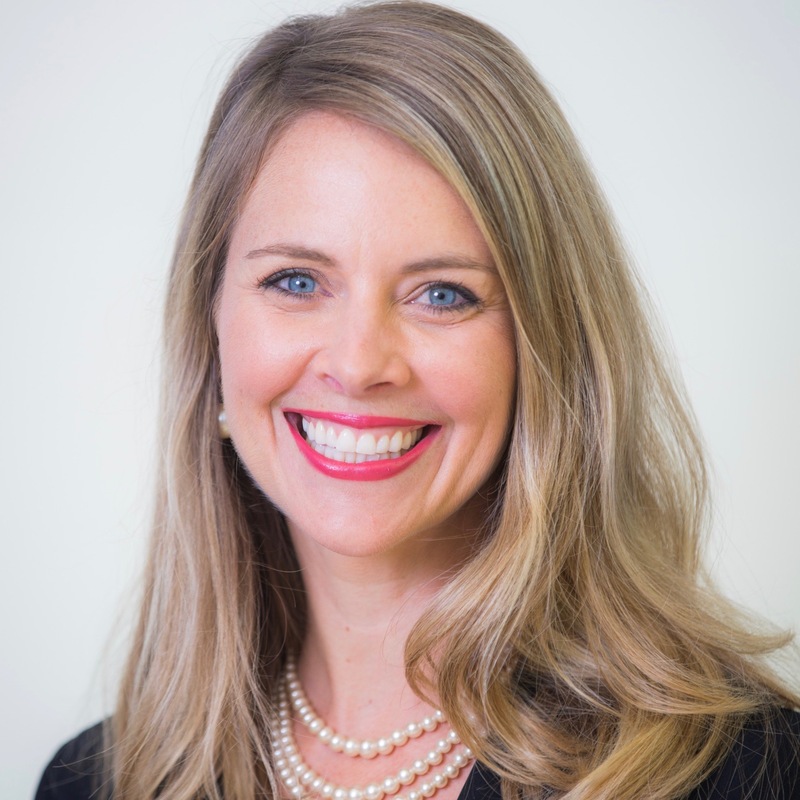 Those employees, aka space administrators, can create messages, events, forms; whatever content that’s deemed valuable for employees in their particular office location or target group. 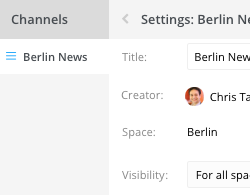 How is Spaces different from creating news channels for each location? Our Spaces feature allows for more than just the creation of location-specific news. Each space can also display different plugins, different use cases, and even different news channels for each location. For example, company locations in Germany might use the meal plan plugin to highlight the various dishes available in their different office cafeterias, but this plugin might be pointless for company locations in the US that don’t have in-office cafeterias. Instead, US locations might like an additional news channel for their Space that includes updates on health and wellness benefits, information that isn’t relevant to German locations. Local administrators can also create and manage content for each Space independently to ensure that its features and messages are relevant to the audience within their Space. And local admins don’t need to worry about setting visibility and permissions for content in their individual Space. Each employee in their Space will receive the same targeted content, since these settings are managed when the Space is configured. How many plugins can each Space hold? There's no limit to the number of plugins and channels in each Space. 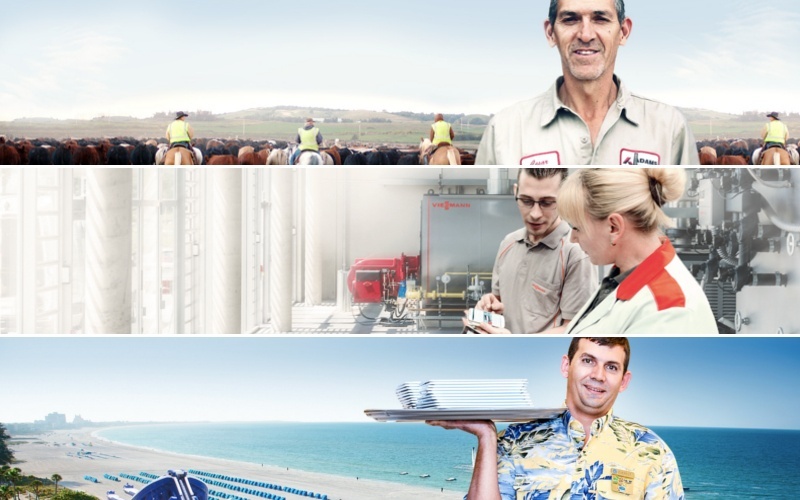 Ask your employees what content and functions might suit them best. The sky’s the limit! How can I move my current content to Spaces? In the Admin interface, select content and move it directly to a Space. Out of this world! This sounds complicated! 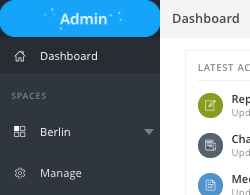 How can I keep the overview in the Admin interface? As an overall site administrator or manager of multiple locations, you can filter the Admin interface to show only the content of one specific space. Stay focused while managing your employee app! What options do I have for targeting Spaces? Through Staffbase you can assign user groups or individual users to Spaces in order to target content to a specific location, project, or use case. User groups are flexible and can be configured for complex cases themselves. For further details regarding Spaces, view our release update here.